The space you have available for storage doesn’t just include floor space. When things get tight on the ground, most buildings still have plenty of unused vertical space. All you have to do is look upward to see that most of the available space in a building is higher than we can reach. Without pallet rack, you can only stock items as high as you can reach. 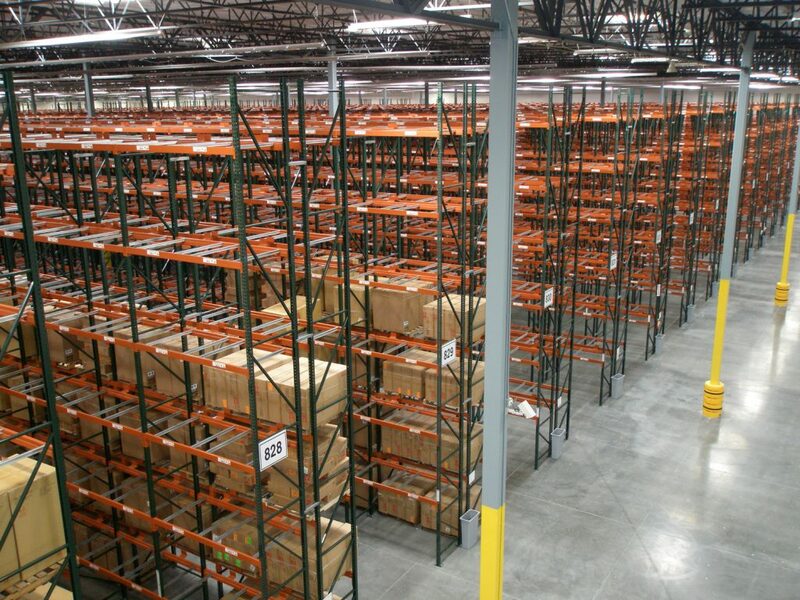 Warehouse racking systems make it possible to tap into your unused vertical space, making your storage more efficient. Many customers come to us with plans to buy or rent additional storage space, when all they really need to do is make better use of their current space. Our job is to help them do that. We help you improve your storage efficiency by providing a way to utilize vertical space. As a major distributor of in-stock pallet racking, we have the products and know-how to help you reach your storage goals. We’ll leverage our large inventory of both new and used pallet rack to ship orders within 24-48 hours. Our popular brands include Ridg-U-Rak, Steel King, and more. In addition to our pallet rack and shelving selection, we also offer wire decking from trusted names like J&L Wire, Nashville Wire Products, and ITC Manufacturing. Our two stocking locations in Minnesota and Pennsylvania allow us to minimize freight costs for orders both local and nationwide. We know freight, and we always do our best to provide you with the best possible combination of price and service. We strongly believe in providing our customers with real storage solutions, not just products. We want to help you achieve the results you’re looking for. If you have any questions or would like guidance implementing your new system, our pallet rack experts are here to help. Our experienced sales staff will always listen carefully to your needs before quoting products or services. Interested in learning more about pallet racking? Check out our pallet rack guide for useful information to get started. Get a same-day quote or give us a call at 800-722-5908 to talk with a Pallet Rack Specialist. 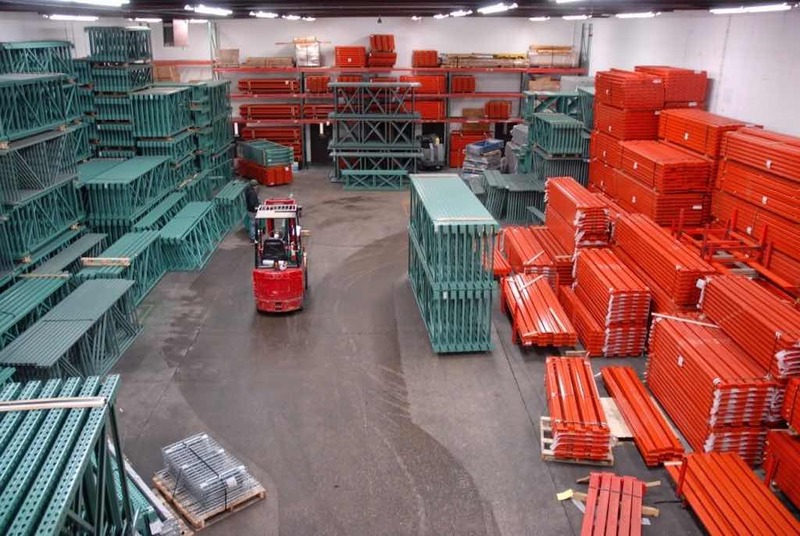 We maintain a full inventory of pallet rack, meaning your order ships within 24-48 hours. 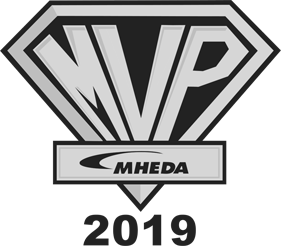 We’re headquartered in Maple Grove, Minnesota. Because we own all of the products in our three main warehouses, we’re able to offer quality, US-made products with a fast turnaround. 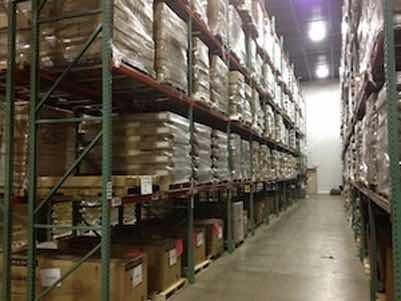 Orders typically ship within 24-48 hours and our Pallet Rack Specialists help ensure that you’re getting the right pallet racking for your storage needs. We always welcome customers who want to inspect the racking in person and speak with a member of our sales staff in person. While we’re headquartered in Minnesota, we serve customers across the United States. From small business to Fortune 500 companies, we help businesses across the country improve their storage efficiency. If you already know what you need and are ready to buy, call 800-722-5908 or visit our online pallet rack store. Used pallet racking is a great option for those looking to increase storage space while working within a budget. In fact, you can expect to save up to 30% when you choose used pallet racking. For us, used pallet rack isn’t just an afterthought. 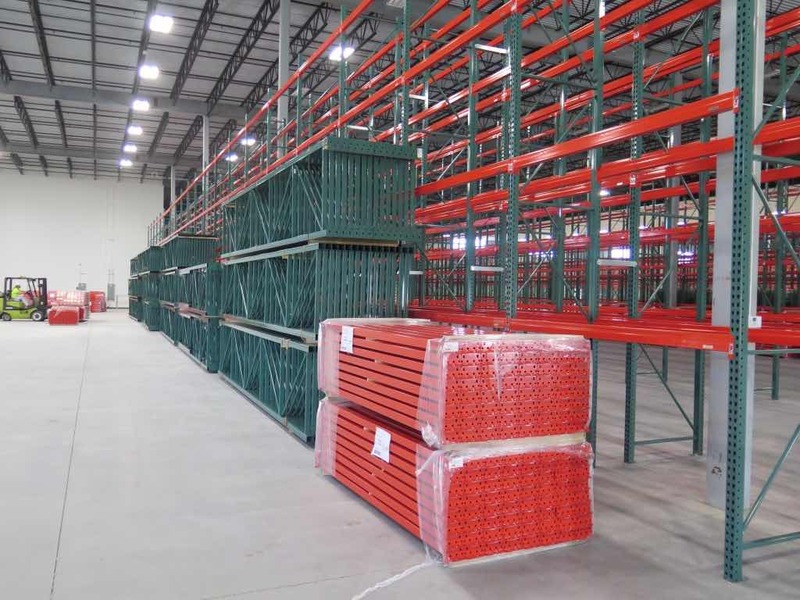 We understand the need to offer used pallet racking that doesn’t sacrifice quality. We’ve dedicated an entire warehouse at our Maple Grove, Minnesota location to our used inventory. We’re constantly adding to and hand-sorting our used inventory. The result? One of the largest used pallet rack selections in the Midwest. While much of our used pallet rack is in the form of teardrop racking, we have a wide range of different manufacturers and styles from which to choose. If you’re interested in learning more about used pallet racking, send us a quote request or head to our used rack page. A common mistake when purchasing pallet rack is underestimating capacity needs. Industrial pallet rack beam capacity can be calculated by using your single heaviest pallet load weight and multiplying that by the number of pallet positions per beam level. Example: 96″ beams with 3000 lb pallets stored on them need to hold a total of 6000 lbs capacity per pair (3,000 x 2 pallets per level). Standard pallet racks are generally manufactured to hold 2500 lbs per pallet position. Once the beam capacity is estimated, the required frame capacity must also be calculated. 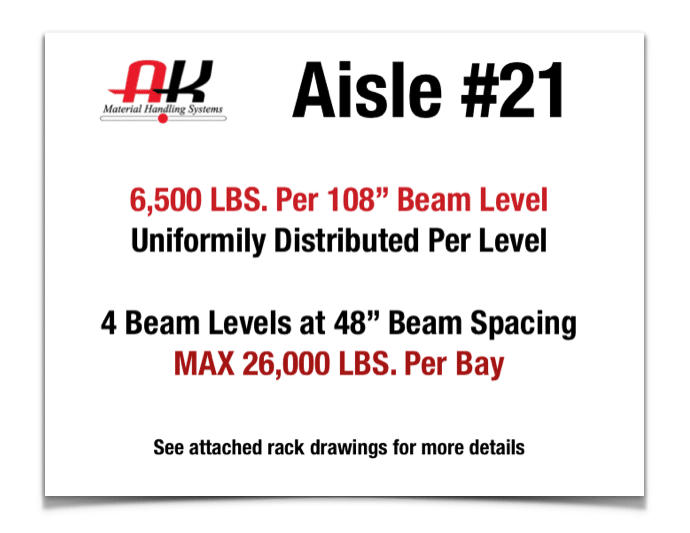 The estimated pallet rack frame capacity requirement can be found by using the capacity per beam level on your rack and finding out the maximum vertical beam spacing that the system will be using. Beam spacing needs to be measured from the top of one beam level to the top of the next beam level. 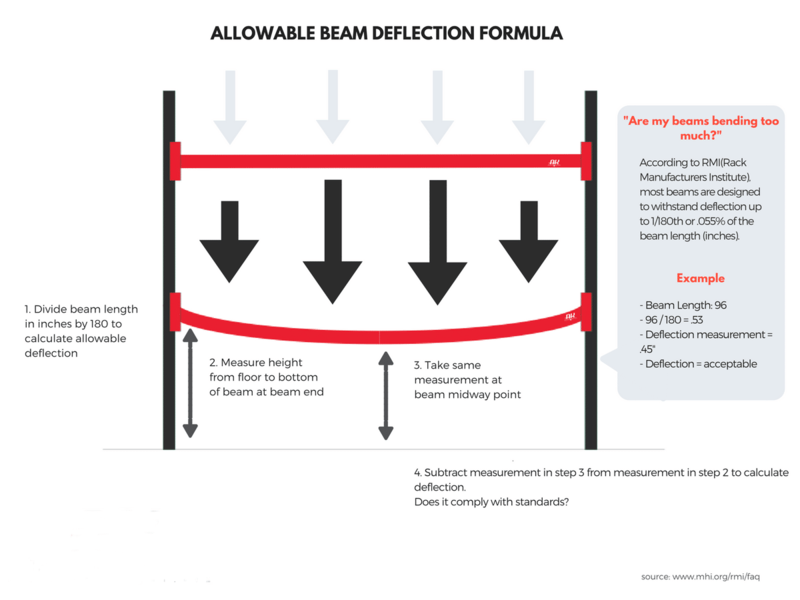 Example: if there’s a 48″ clear between your rack beams when using 4″ high beams, the frame capacity should be calculated using 52″ beam spacing. You’ll add the beam height to the overall spacing. Pallet rack capacity needs should be determined by a pallet rack professional for each application. It should not be roughly figured or estimated by an untrained person. We always recommend professional assistance when purchasing pallet rack and calculating pallet rack capacity needs to ensure the safety of personnel and equipment. This information was written to help clients gain a general understanding of how pallet rack capacity is determined. If you want to learn more about pallet rack capacity, give us a call at 800-722-5908 and we’ll be happy to help! Cost-effective — in general, selective pallet rack is the least expensive rack option available on the market. Versatility — selective racking setups are highly customizable and easy to adjust as demands shift. Compatibility — the majority of teardrop pallet rack styles are compatible with one another, making it easy to add to your current rack system or replace components even if the same brand of racking is not available. Ease of assembly — selective pallet rack is assembled much like rivet shelving but on a larger scale. 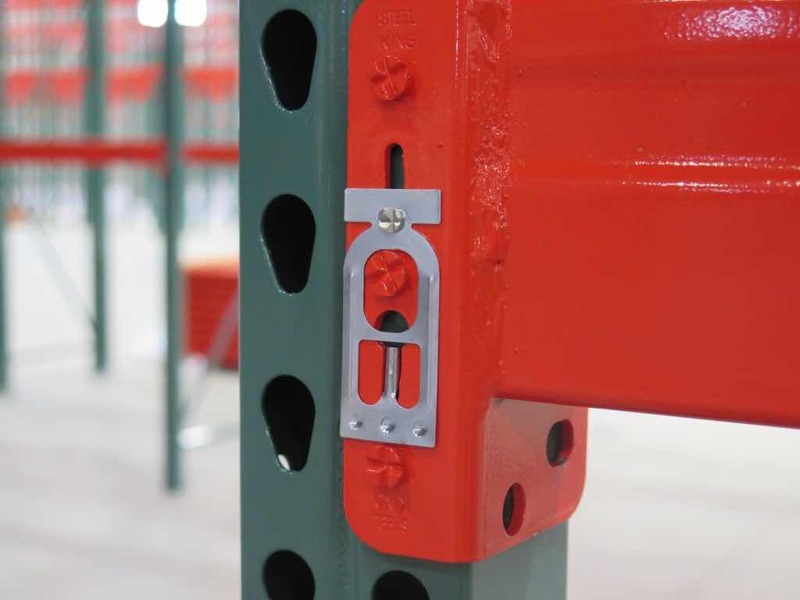 Most types of pallet rack beams simply lock into frames and are then secured in place with safety clips. Strength — selective pallet rack is sturdy enough to handle even the most heavy-duty loads and can be custom manufactured for applications requiring high-strength steel. Easy to reconfigure for increased storage density or a more efficient warehouse layout. Reduced handling time — forklift operators can quickly and easily load or unload pallets from selective pallet rack systems. How to find the right pallet rack beams? The correct beam length for your application is calculated by adding together the widths of the pallet loads, 5″ side clearance between the uprights and pallets, and a 6″ space between pallet loads. Beam measurements: Length equals the total distance between uprights. Height is measured from the top to bottom of the front side of the beam. How to find the right pallet rack uprights? Capacities are based on 48″ beam spacing. Depth of the frame should be 6″ less than the pallet length. For example, a 48″ deep pallet requires a rack with 42″ depth. Frame measurements: Frame height = (height of pallet + height of beam + 4″ vertical clearance) x number of levels.